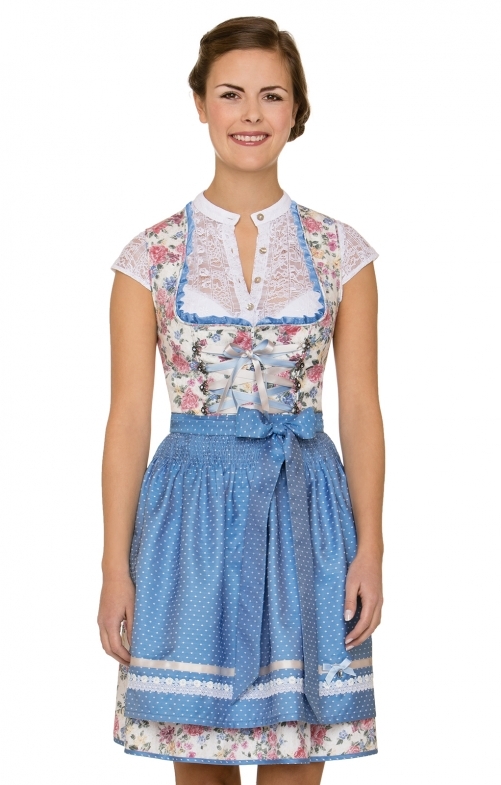 Midi Dirndl Saskia for women by Stockerpoint in flower and light blue. The stylish dirndl made of easy-care cotton impresses with its floral all over pattern and convinces with loving details. The bodice features a round neckline and elegant bodice hooks and features a playful lacing in a two-tone satin ribbon and feminine ruffles, while a pleated and elegantly falling skirt with a slit pocket completes the overall look. The apron of matching polka dot jacquard completes the overall picture with the sewn-on decorative ribbons. Preis/Leistung war gut. Ich habe mich aber für win anderes Modell entschieden.